In July, the museum was proud to welcome a group from Meadowview Baptist Church in Starkville for a guided tour of the collection! Ava Moore was my close friend for more than 21 years, and it is my honor in her memory to inaugurate the Ava Moore Historical Leadership Award. The Ava Moore Award will be presented each year by the Friends of the Oktibbeha County Heritage Museum at this Denim & Diamonds event to an individual who has demonstrated outstanding leadership in preserving and promoting local history in Oktibbeha County. Ava’s death in 2014 was a shock to us all. She provided great leadership as president of the Friends of the Oktibbeha County Heritage Museum. When the Friends of the Museum organization was established in 2008, Ava served on the initial Board of Directors. That’s not surprising because whenever anything good was going on in Starkville, Ava Moore was right in the middle of it. She was a driving force for community development. 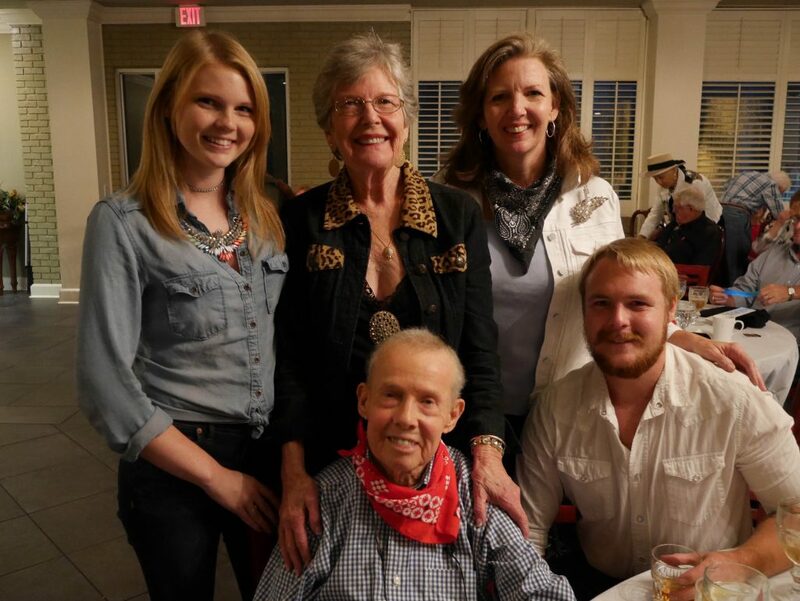 Patsy Stuart, Wanda Thorne, and Ava Moore, co-chaired the first “Denim & Diamonds” fundraiser for the museum, and Ava worked hard on that project each year. 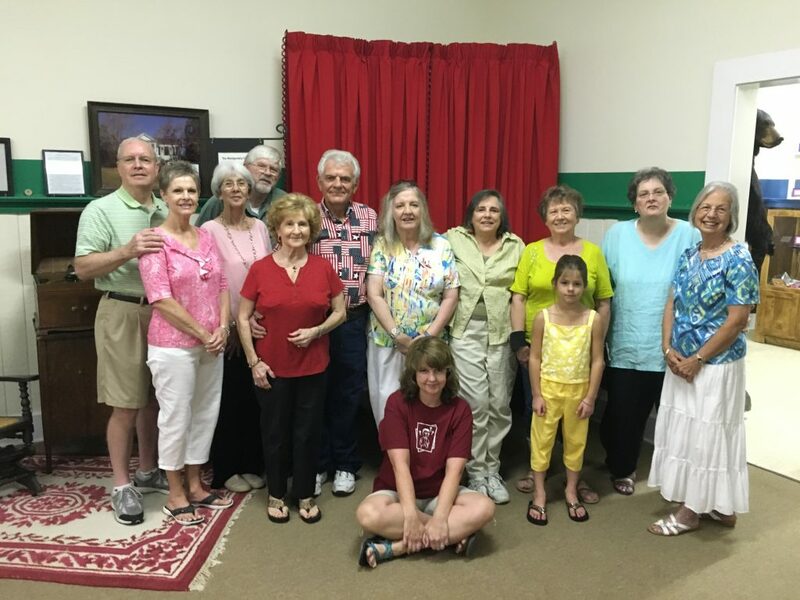 The Friends of the Museum wanted to find a fitting way to memorialize Ava and to annually recognize the leadership of an individual who has made a significant impact on preserving and promoting the history of Starkville and Oktibbeha County. That is why we established the Ava Moore Award. The first Ava Moore Award recipient is the founder and first president of the Friends of the Museum back in 2008. She recruited Ava and many others to be on the board. She and her husband moved to Starkville in 1970. She retired from Mississippi State University in 2003, and has been a tremendous leader in our community. I think she’s a professional volunteer. This person has been an officer with the Starkville Area Arts Council, MSU Women’s Club, and M’Lady Garden Club. She’s active with the Association of Retired Faculty. But she’s being honored as the founder and first president of the Friends of the Museum. She will tell you she had a lot of help, and a lot of you in this room helped her, but in another way, this person was like the Little Red Hen. She wrote the first by-laws, registered the group with the Secretary of State’s office, started the website for the museum and then became the website editor. She photographed and documented progress at the museum. She created the Friends organization and she raised funds from individuals and businesses to support the museum. She co-chaired the first Denim & Diamonds event four years ago. She continued to be a leader in organizing this event each year. She has done so much for the museum and provided outstanding leadership. 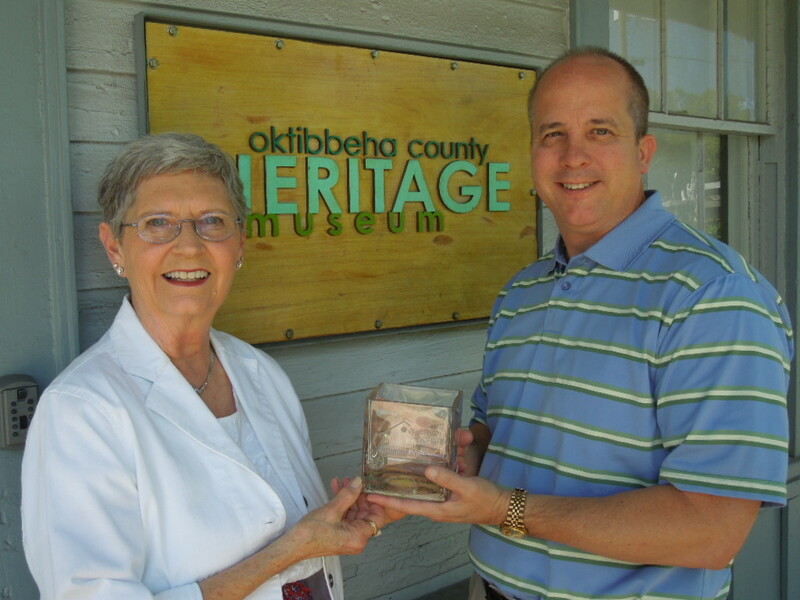 She is the heart and soul of the Oktibbeha County Heritage Museum and we wouldn’t be where we are today without her. She loved Ava Moore, and I think it is especially fitting and proper that she be the first recipient of an award in memory of Ava. By now, you know who it is. It is with great pleasure that I formally announce to you that the recipient of the first Ava Moore Award is Wanda Thorne. The story of Porter Phillips and Ada Hollingsworth Phillips is one of love at first sight. It was in Selma, Al that they met at the train station. Porter took one look at her and said to his friend, “I am going to marry that pretty girl!” Ada was engaged to someone else but Porter took care of that! They were married November 20, 1917 in Uniontown, AL and soon after that moved to Starkville in 1917. Porter’s father Lee Phillips and his step-grandmother, Ada Simpson Phillips, lived where the Hampton Inn is located now. William Preston Phillips, Walter (Skeeter) Ellis Phillips, James Porter (J.P.), Minnie Delle Phillips, Bessie Pauline Phillips, Annie Louise Phillips, Lee Roy Phillips and Betty Jane Phillips. From this family 96 have attended Mississippi State University, 72 graduated and 16 are currently attending. A family tradition at Mississippi State University of which they are proud! It all began by taking the family to college at a young age. They would walk the tracks to the to see everything going on at the college. That love of Mississippi State and sporting events grew through the years. No matter what state they live, they all want to come “home” to Mississippi State University to attend college; however a few did chose Ole Miss. World War II and Pearl Harbor changed the world and lives of the Phillips Family. All four boys joined the service and served overseas. The four sisters married and their husbands also served in the military. Many nights the girls and their mother would sit around the dining table writing letters to the four sons and son-in-laws overseas while praying for their safe return. All eight of them returned safely and began great families of their own. Porter was a merchant, farmer, trader and the Sheriff of Oktibbeha County. He had a Grade A Dairy which he sold milk to Perry Creamery. His milk cans were labeled No. 2. His “slaughter house” set approximately where the Starkville High Football Practice Field is today. Mother would set up a “hamburger stand” during cattle events and cook hamburgers to sell. Across from their house on Louisville Street, they built a clay tennis court where all their friends in town and the college played. He traded property all over town such as the Valentine house, the Dorman house, the Chester Jarnigan house, the Peters house in Sessums, and the Hampton Ellis house with the white picket fence around it on Russell Street. In 1929, he purchased 20 acres of land on Louisville Road where he built his three bedroom home which cost $28 hundred dollars. This house still stands today holding many fond memories of home to the family. They had a goat cart that they rode down Main Street waving to everyone. One bedroom was for the parents, one for the four boys and one for the four girls. The first remote Radio Station was located in the Hotel Chester and Delle was an accomplished piano player and she would play while Pauline sang during intermissions. People who heard them would congratulate them the next day. Pauline, Louise and Betty played the xylophone in the Starkville High School Band. School every day where they all enjoyed all the sporting events from baseball, basketball and football, etc. One was so good he made the semipros. As the eight children grew up, there was no television, so we had to play our own games such as King Tut, paper dolls, slingshots, riding in the goat cart, craw fishing, roller skating on sidewalks, jump rope, Mama, May I, Pop the Whip, hopscotch, hide and seek, etc. “Kambo, Karo, Aro, Jaro, Rack-astack, penny winkle, flam a doodle, yellow bug, Molly, won’t you come-bo” is a tongue twister Grandpa Lee Phillips taught his grandchildren while sitting on his knee. What wonderful memories we all have -some make us cry but more of them make us smile. And even though we might remember in different ways, we all cherish the memories of Porter and Ada Phillips and the family they nourished. Of all the blessings Pa Porter and Mama Ada gave their children, grandchildren, great-grandchildren, the most important was witnessing their faith and having the certain knowledge that one day all the tears will be wiped away. Porter and Ada Phillips reared their eight children with love for Christ and love for each other, with respect for themselves and for others, and with love for our country. Those born into this family are grateful for their strong belief in right and wrong, in self-sufficiency, and each of us trying to make the world a little better. This is a legacy that we treasure and take pride in our stories and memories of our Phillips family. 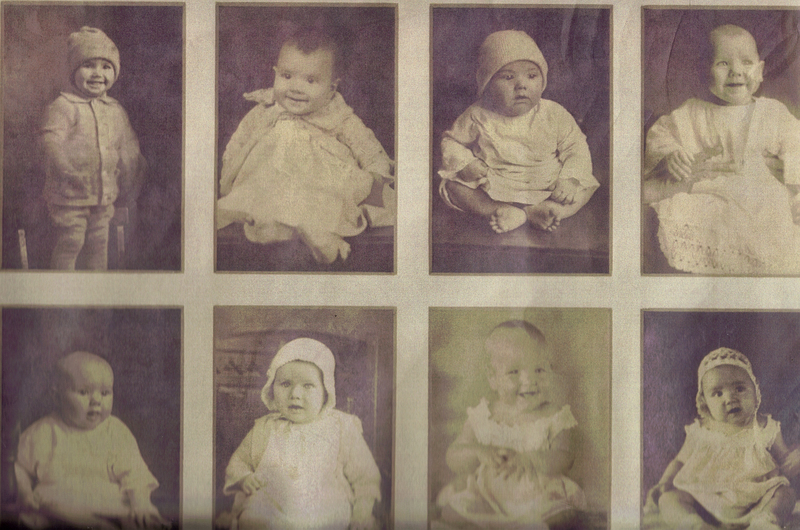 A family reunion picture showing the eight children and their parents. 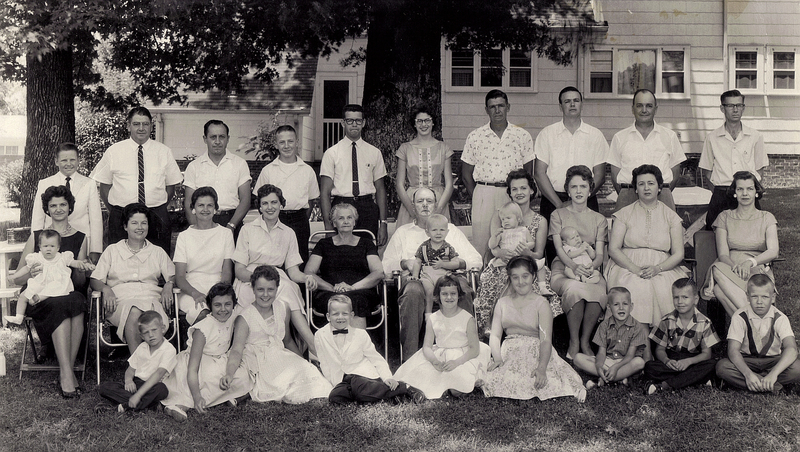 Porter and Ada Phillips are shown in the middle on the second row with Porter holding a child. Porter and Ada Phillips both worked for J. W. Sanders Textile Mill and worked in the spinning room. They made 80 cents a day. After they quit working at the mill, Porter started selling “iced down meat” out of a tub under a cedar tree on Mill Street. Then they put in a little store called Phillips Grocery and Meat Market on Gillespie Street about where the turntable is in Needmore. They sold meat, vegetables and other groceries. When they closed, they let all the mill people have all that was in the store, because their dad said, “they needed it.” From there they moved to town across from the First Baptist Church on the corner of Lampkin and Lafayette Street (Larry Mullins CFP/CIS is today). They sold meat in their store until the meat inspection law was passed. Ada took orders by phone and they were delivered to homes. In 1940 Porter was elected sheriff of Oktibbeha County. His son, Preston, was the tax collector and John High was deputy sheriff. In those days two main jobs of the sheriff were whiskey stills and taking the insane to Whitfield. Riding through the county, he would spot smoke coming up out of no where and later go back and investigate to find a whiskey still. Taking people to Whitfield, he had to have someone in the car with him and would take one of his family so they got to go on trips and see things that others did not have the opportunity. Lee Roy Phillips, son of Porter and Ada, is an excellent writer and wrote a poem to each of them as follows. They worked hard both day and night. Located in swamps, woods, thickets or foot of a hill. Caught record number of rustlers in his first year. You had to leave the county even buy a beer. The county was dry, no beer or wine. The joints all moved across the county line. If you broke the law regardless of what you thought. He would not stop till you were caught. Everyone who knew him knew where he stood. He was going to keep the county safe any way he could. How to be respectable and carry their share of the load. He loved his God, Family and his state. Worked hard his years to keep his county great. To me, he’s my hero, idol, best friend I ever had. I’m so proud of him, for he’s my Dad. This is about a special person in my life. Mother of ten children and my daddy’s wife. Worked hard and supported daddy through the years. Many happy times and sometime sad with tears. She had beautiful complexion, loveliest skin you’ve ever seen. Fixed her face every day, for she was Porter’s queen. Do something wrong and she would make you cut a switch. I would get her to plead for me and he would let me go. When she was holding them, she was on top of the world. We praise God for our special Mom and Dad. When our journeys over to all be with God one day. It has been more than 70 years since Horace Harned was a young lieutenant serving in a mapping squadron assigned to the famed Flying Tigers of the U. S. Army Air Force’s 14th Wing in China. His recollections as a member of the ground crews mapping thousands of square miles in southern China bring tears to his eyes. Sometimes they are tears of laughter, sometimes tears of emotion, from memories of experiences that were arduous at best, life-threatening at worse. These memories were rekindled for Harned when he and his wife joined more than 600 former Flying Tigers and their families for a reunion in Taipei, Taiwan, in observance of the 40th anniversary at the ending of World War II. The 14thAir Force Association was invited to hold the reunion in Taiwan by the Chinese Air Force and other veterans’ and governmental groups. The 14th Air Force Wing was activated under the command of General Claire Chennault after the Japanese attack on Pearl Harbor on December 7, 1941. Joining with the Chinese, commanded by Generalissimo Chiang Kai-sheik, the wing soon earned the title of the Flying Tigers and became a strong force in the eventual defeat of the Japanese. 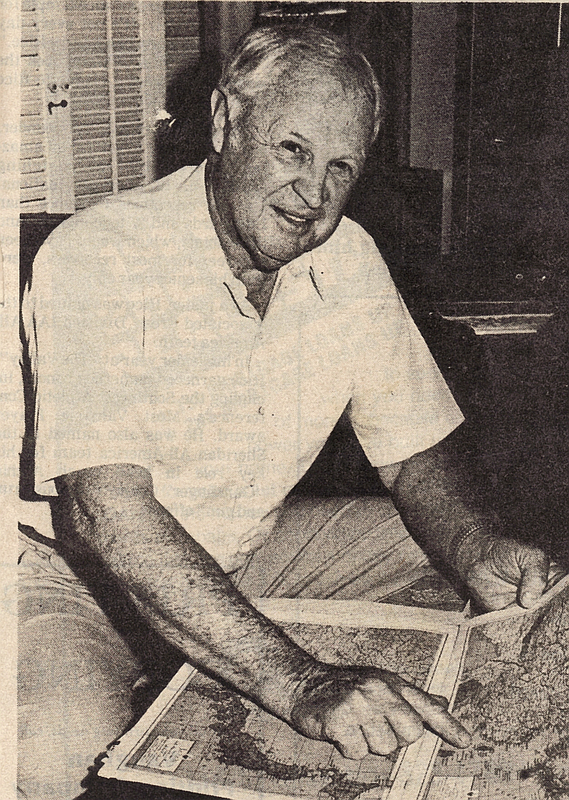 When Harned completed his degree in geology at Mississippi State College in 1942, he joined the Army Air Force. His eyesight prevented him from entering pilot training, and he was sent to Denver for a three-month course preparing him to be a photographic lab commander. Commissioned a second lieutent on No. 7, 1942, he was assigned to the USAF First Mapping Group whose goal was to improve aerial maps for the Air Force. Prior to duty in China, and after additional training in Washington, D. C. Harned helped map the West coast of Mexico, a two-month assignment. In November of 1943, he was assigned to the 3rd Mapping Squadron that was attached to the Flying Tigers in China. His trip took six weeks because the Japanese had most of the Pacific Ocean closed to American ships and aircraft and his route took him by way of Brazil, Africa and India. Harned spent 12 months in China as commander of ground “geodet” parties responsible for setting up stations at 50-mile intervals in an area the size of the southeastern quarter of the United States. Using an equlangulator to observe the stars, the crew determined the latitude and longitude of the station, which could be a shed, rock, formation, bridge or anything that could be identified on aerial photographs. This information was combined with the aerial photographs of the area to develop aeronautical charts for pilots. Most of the territory mapped by the ground units of the photographic wing lay in remote areas of China often inhabited by unfriendly bandits or curious tribesmen who had never before seen a white man. The ground party carried everything it needed on its forays, usually camping in tents but sometimes finding shelter with missionaries. Harned, an avid hunter and fisherman since childhood, supplemented their G. I. Rations with fish and game from the rivers and forests in which they traveled. Harned kept a daily journal of his activities and took photographs that were destroyed in a fire at his home in 1963. Fortunately, several years ago the widow of his sergeant gave him her husband’s album that contained many of Harned’s photographs. The pictures range from breathtaking views of mountains and waterfalls to those revealing the harsh conditions of the countryside. One picture shows the crew’s jeep atop a huge rockslide that blocked the narrow dirt road. Another captured the puzzled expressions on the faces of mountain tribesmen as they marveled at the strangers with the four-wheeled vehicles and mysterious equipment. Another is of laughing men riding horses and donkeys over terrain impassible by jeep. One of life’s strange coincidences occurred when Harned chanced upon a cousin of his grandfather, Arthur Rice. The cousin, who had visited in Starkville when Harned was a child, was a missionary who had been evacuated from behind Japanese lines but who was trying to return to his mission. “I never found out what happened to him,” Harned said. The China project completed, Harned left China in December 1944, arriving in Starkville in time to celebrate Christmas with his family. He was next assigned to mapping duty in South America, in countries then known as British, Dutch and French Guiana (only French Guiana retains its name today). Shortly after arriving in South American, the Air Force personnel were invited to the French Guiana governor’s mansion to celebrate V. E. Day, when Germany surrendered to the Allies. It would be August before the surrender of the Japanese ended World War II. During the nine months in South American, Harned’s unit set up stations in areas where the only previous outsiders had been missionaries. “There were no roads and we had to travel by air or water.” Harned said, describing a 1928 bi-plane they rented for $50 an hour. “It was pretty-hair-raising as we skimmed along the treetops about 90 miles an hour trying to find some water to land on,” he said with a smile. Finishing the Guiana work in February 1946, Harned once again headed for home. Suffering from severe stomach ulcers he spent two months in an Army hospital in Denver before being discharged from the Air Force and returning to Starkville. His military duty influenced Harned to change his mind about his life’s vocation. His interest in geology began when he was a youngster looking for fossils and Indian relics around his father’s farm. I decided to major in geology in college because of this interest and because I thought it would allow men to travel a lot. Well, I had enough of travel during the war, so when I came home I decided to help my aunt with her farm,” Harned said. His aunt, Nannie Rice was librarian at Mississippi State and one of the girl’s dormitories on campus is named for her. In 1949, Harned married Nellie Jean Howell. They built their house in 1951, the same year Harned ran for and won a seat in the Mississippi Senate representing Oktibbeha and Choctaw counties. In those days, a senator could not succeed himself because the Senate seat was alternated between the counties. After “resting a term,” Harned ran for the House of Representatives where legislators could succeed themselves, thus building seniority. He served 20 years in the House and because of frequent redistricting, represented a different constituency each term. Harned was always a strong supporter of Mississippi State and served as chairman of the university and colleges committee for 12 years. His father, Horace Harned, Sr., was a professor of bacteriology at State and Harned and his two brothers and two sisters grew up in a house on the campus. His father owned extensive land bordering the campus and had the largest dairy herd in the town, “one of the best Jersey herds in the state,” Harned claimed with pride. Harned played football and ran track at Starkville High. At MSU he took the two-year basic ROTC course and ran track o the cross-country team. The Harned are the parents of three daughters and a son. Since leaving the legislature, he has devoted his time to farming. Perhaps due to his travels abroad during the war, he still has a deep interest in internal affairs. He is grateful for the opportunities he had to meet people from other cultures during the war. “We lived close to the people and learned to know and understand them,” he said. Horace Harned, Jr. still attends his Starkville High School Class Reunion hosted by John Robert Arnold and represents with pride the class of 1938. Many people have asked me to write a story on Judge Mac as he was affectionately known and loved. He was a “self-trained man.” His stories of sports, milk routes, gas stations, superettes, justice of the peace and as mayor, were fun stories to hear. Most of his stories centered around the gas station and the superette where Tim Turman’s Strombelli’s is today at 408 University Drive. When Robert Lee McDavid was playing football at Macon High School in the 1930s, he liked getting off the bench and into the game. But when he stepped down from the bench as justice court judge, it was entirely a different feeling. “I’m going to miss it, I know that. But it was time for me to retire,” said McDavid, who was 65 and had served in the county court system for 28 years. “Judge Mac” first ran for justice of the peace in Oktibbeha County in 1959. He had four opponents and came within 35 votes of having a majority in the first primary. He was re-elected six times and ran unopposed only once. During his seven terms in office, McDavid tried some 50,000 cases with the vast majority of them being traffic offenses. He has married about 1,000 couples in a variety of settings – on a motorcycle, in the grease room of his service station, and in a van. “There’s one fellow I’ve performed the wedding service for four times,” he said with a chuckle. Often couples would meet the judge at his home and several asked to be married on the front porch or the patio. Many changes have been made in the county court system over the years. One of the most visible is the use of judges’ robes that began several years ago. “It really adds a lot to the dignity of the proceedings,” said McDavid, who recalled being summoned to court one day from the swimming pool where he had taken his grandchildren. “The defendants didn’t have time for me to go home and change, so I just went in my swimming trunks,” he said with a smile. Jury trials were more common in his early career. “If a man wanted a jury trial, we’d have to round up six people, sometimes just pulling them off the street,” he said. Today, jury members are drawn from a pool just as for other courts. “But we have very few jury trials now,” he added. When McDavid took office, he had had no training for the job. He learned by talking with other judges and attorneys. “The lawyers around town have always been great to me,” he commented. As time passed, more training requirements for justice court judges were initiated. In 1983, the name was changed from justice of peace and the number of judges became tied to the population in the county; and judges were required to take 32 hours of schooling their first year in office and 18 hours every year afterwards. Judges were also put on a salary instead of being paid from fees and fines collected. And now the court cases are assigned to the three justices and there three clerks to handle the paper work and collect fees and fines. “It’s a whole let better than it was. People don’t realize just how good a system we have,” McDavid said. Born and raised near Macon, McDavid played football, basketball and baseball at Macon High School. His love of sports continued for many years. He umpired Little League baseball and was statistician for Starkville High School games, reporting the results on the halftime radio show. “I never missed a game for 20 years,” he said. After graduating from high school in 1940, McDavid joined the U. S. Army serving 27 months in the quartermaster corps in England and France during World War II. When he returned home in 1945, he married his high school sweetheart, Annie Mae, who has been his wife for 42 years. Looking for a better job than his work at a local grocery store, he and his family moved to Starkville in 1946. 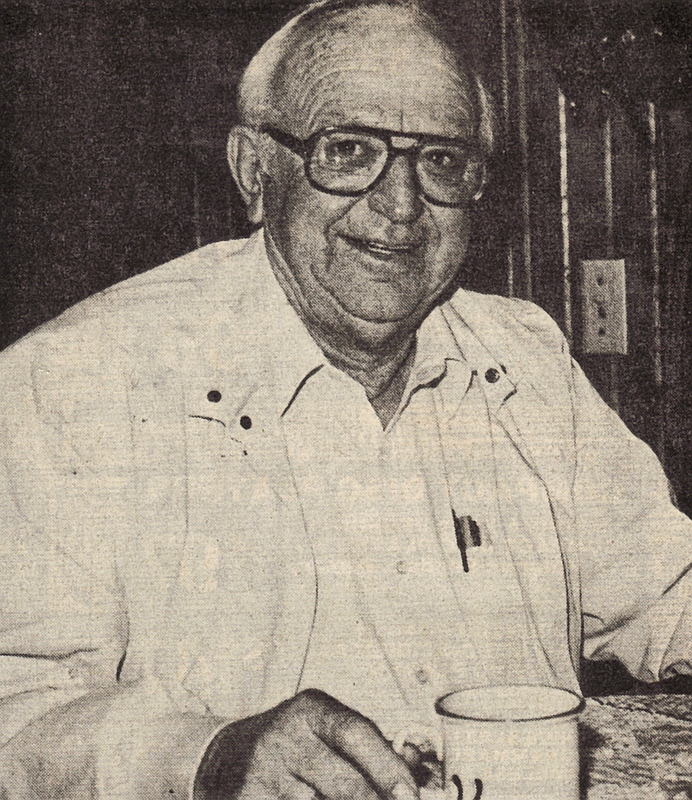 He worked for Perry Creamery until the company closed the Starkville plant in 1959. That was the year he decided to run for justice of the peace. “I didn’t have the $25 to qualify, so a friend loaned it to me,” he said. I had been exposed to county politics all my life, though. My grandfather was on the Board of Supervisors in Noxubee County for years and my uncle was circuit clerk there for a long time. McDavid was involved in a variety of business ventures including running milk routes, owning and operating service stations and operating superettes. “I’ve turned all that over to the boys. The McDavids have five children. “Starkville is a great place and I would not live anywhere else in the world,” he said. They are members of First Presbyterian Church and McDavid is president of the Starkville Shrine Club and a member of the Masons, Eastern Star, Rebekahs, Odd Fellows and Scottish Rite Masons. He was on the Board of Directors of the Tennessee/Mississippi Law Enforcement Officers Association and former board member of the Mississippi Sheriffs’ and Peace Officers Association. His last official act as justice court was swearing in county officials. “I won’t miss being “on call” day and night, but I will miss the people and being involved with the people. Judge Mac died in 2005. 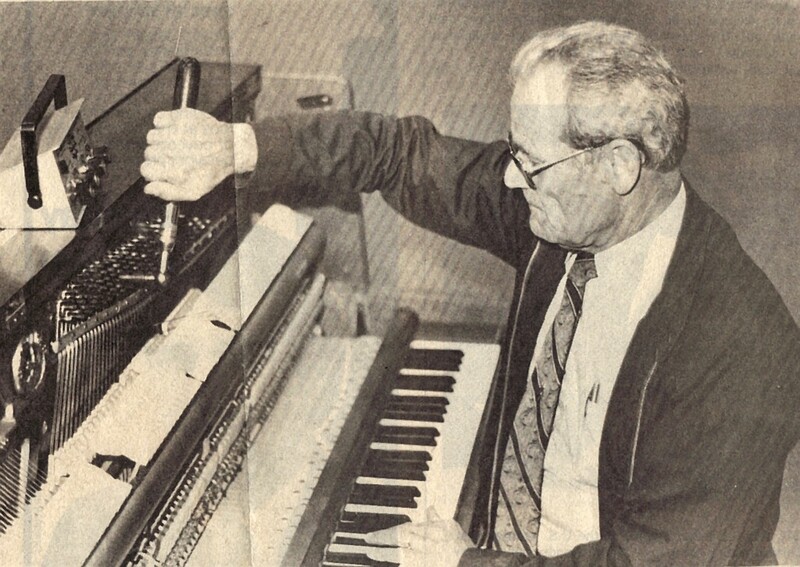 He served as mayor of Starkville from 1989-1993 and as a Justice Court judge from 1959-1988. Shown is the picturesque building for Enology Research at Mississippi State University. The structure was designed to resemble a Swiss chalet. In 1970s, Mississippi State University began researching whether muscadines could be used for winemaking. The facts that the horticulture department’s project is dealing in large part with the growing of muscadine grapes, the fermentation of the juice, and the processing of wine have evoked some humorous speculation. However, to the scientists involved, the research is serious business, the results of which could be beneficial in the economy and agriculture of Mississippi. A major facet of the research is in ascertaining the feasibility of domestic production of native wines from grapes grown in Mississippi. Dr. Gene Overcash, director of the viticulture phase of the project, is shown Inspecting a cluster of the developing fruit which should be ready for harvesting. The data derived from the enology research with muscadines may provide farmers and vintners with the information needed to initiate and develop a winemaking industry in the state. From available statistics, it appears that there is already a large market for wine in the state. According to a recent issue of Wines and Vines publication, the consumption of wine in the state increased 62 percent from 1971 to 1974 with Mississippians consuming 1,287,000 gallons in 1974. The question is, can a palatable and commercially saleable wine be processed from native muscadine grapes? This is the initial focus of the project, although research will not be limited to wines, but will encompass experimentation in the processing of juice concentrates, vinegar, jellies, jams and preserves of other fruits, berries and vegetables. The current laws regulating the production of wine in Mississippi do not prohibit commercial production but do impose high fees. These, along with staff competitions in the industry from established wineries in California and New York are not conductive to an individual taking the gamble on an unproven product. Legislation has been introduced in the state legislature to reduce the $1800 annual privilege license fee for wine manufacturers to $10 per 10,000 gallons on native wine. Under the proposed law, native wine producers would be required to post a $5,000 bond instead of a $100,000 bond required of other wine producers; and the $.35 per gallon excise tax would be reduced to $.05 per gallon on native wines. The proposed regulations would also allow retailers and consumers to purchase native wines directly from the producer and not be limited to sale to the State to the State Tax Commission that acts as the wholesale distributor and seller of alcoholic beverages in Mississippi. The MSU research is concentrating on the muscadine grape, which is native to the southeastern area of the country and is highly resistant to disease and decay. Four vineyards producing various varieties of muscadines have been established in diverse areas of the state at agricultural experiment stations in Verona, Crystal Springs, Stoneville and Beaumont. Dr. Gene Overcash of the horticulture department, who is overseeing the viticulture, pointed out that the climate and soil of Mississippi are excellent for growing grapes. He explained that muscadines have been grown for experimental purposes on the MSU campus for at least 50 years. The muscadine is absolutely native to the southeastern region and is found in other areas of the world only where they have been transported from this region. They were found growing wild around the river bottoms of eastern Northern Carolina when the colonists landed there. 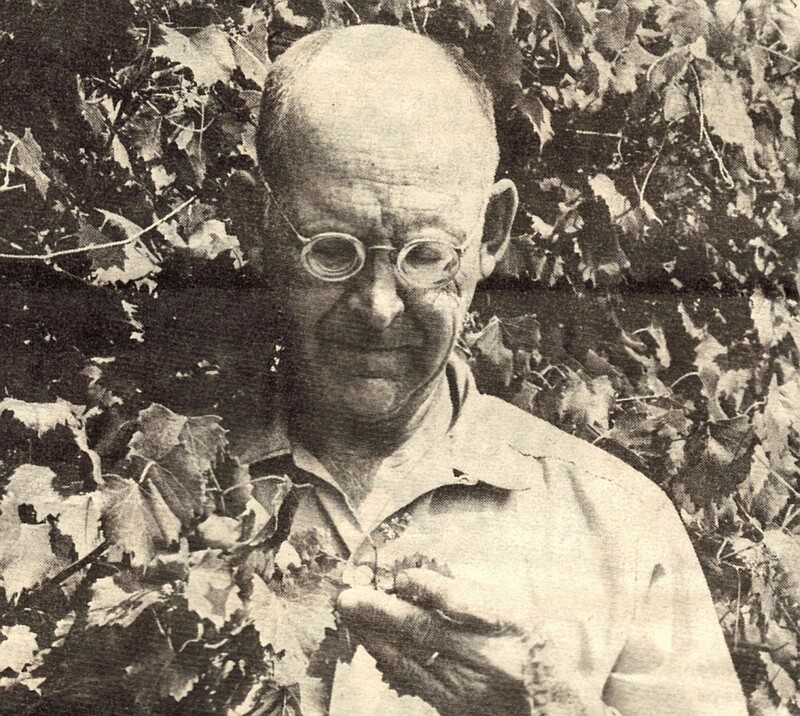 The oldest known variety, the scuppernong, was named for a river in North Carolina. Grapes are hearty plants and will produce for over 50 years. It takes three years after a vine is planted for it to produce a crop. Dr. Overcash said, “ that an average acre of muscadines would yield two to three tons of grapes a year.” He also pointed out that information gleaned from these projects would be helpful to farmers and individuals who want to grow muscadines for their own use. Dr. Boris Stojanovic is the enologist in charge of this phase of the project. A native of Yugoslavia where his father owned a vineyard, he was a microbiologist with the MSU agronomy department for 19 years before becoming involved with the enology research. Winemaking is one of man’s oldest industries. The researchers will look at the total picture of production and processing of fruits and vegetables. Whatever the future of native wineries in Mississippi, the research at MSU will provide a store of scientific information for farmers and individuals as well as for farmers and individuals as well as for other scientists in the continuing development of agriculture. Since the creation of the American Viticultural Area in 1984, there has been very little viticulture in the Mississippi Delta region. Mississippi State University established an enology laboratory to research grapes cultivation in the area, but little commercial activity has resulted. The few wineries that have produced wine from the Mississippi Delta AVA have used native muscadine grapes according to wikipedia. The research did lead to development of muscadine ice cream, muscadine juice and muscadine jelly which is available for sale at the MSU MAFES Sales Store. Shirley Carley wrote about Mayhew many years ago (in the 1970s). But then it was known for the Stover Apiary while today, it known as the Mayhew Tomato Farm. It is a family farming operation that has much more than tomatoes, including the best strawberries around. Besides the best home grown tomatoes, there are all kinds of other produce including onions, okra, watermelons, butter beans, purple hull peas, potatoes, squash, cabbage, eggplant, and cucumbers, among other things. In addition, approximately 25 homemade jellies, jams, preserves, salsas, pickles, tomato juice, and chow-chows, just to name a few. In addition in the fall, there is a pumpkin patch with a carver on site close to Halloween. Carley described Mayhew as follows. ”The community of Mayhew lies quietly among the massive trees and gentle hills north of Highway 82 between Starkville and Columbus virtually unnoticed by the thousands of motorists who pass by it on the busy highway. The past of this unpretentious corner of the world is well known to history buffs of the area. Its beginning predates many of the larger and more progressive communities nearby. The mission grew to include a gristmill, a blacksmith shop and a productive farm. With the approval b Congress of the “Treaty of Dancing Rabbit Creek” in 1831, the Indians began moving west to the reservations established by the government. Kingsbury accompanied a group of his Indian friends in their “trail of tears” to their new home. Sarah had died at the mission in 1822 and is buried in the small graveyard there along with about six other “faithful workers.” The graveyard is all that remains today of the early mission. It is maintained by the First Presbyterian Church of Starkville and is marked by a simple sign erected by the Mayhew Mission Society of the Children of the American Revolution. Apparently the Presbyterian Church at the mission continued until about 1854, but the settlement gradually declined. The new community grew up about five miles southeast of the original site, on the Mobile and Ohio Railroad which was completed in 1861. Mayhew became a shipping point for cotton and cattle and the community flourished. Shown is the abandoned “Bee Post Office.” The old post office at Mayhew was known as the “Bee Post Office because of the thousands of packages of bees mailed from there each year. A post office was established at Mayhew in 1858 and has continued to operate to the present time recently moving to a new brick building. It was formerly housed in a white frame structure near the railroad, known as the “Bee Post Office” because of the main supporter, the Stover Apiary. The apiary is one of the largest bee-shipping industries in the South and annually ships between 25,000 and 30,000 one to five-pound packages of bees to points all over the U. S., Canada, Europe and South America. Large shipments of bees are delivered by truck direct from the apiary, but thousands of small packages are mailed through the post office each year. Mrs. Bass Swendenburg, postmistress who is the granddaughter of the founder of the apiary estimated that the post office serves about 250 patrons, an increase brought about when the Vocational-Technical Center opened across the highway from Mayhew. 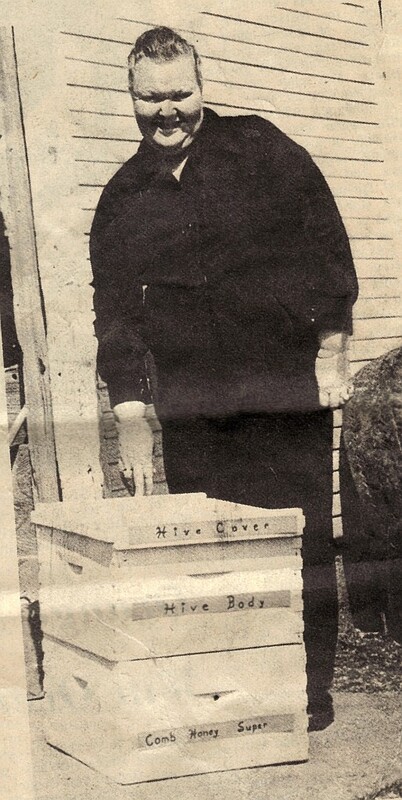 Many Virginia Stover, daughter of the founder of Mayhew’s only industry, is shown standing behind one of the hives manufactured at the apiary. The Stover Apiary began in Mayhew in 1905 when D. D. Stover came from Virginia, where he had previously been on the bee business. For many years, honey was he main money crop but by 1935, the transition to the shipping of bees was complete. The shipment and delivery of the bees to the culmination of a year-round program at the industry that is literally self contained. Not only are the bees raised there in 7000 colonies, but also the hives and shipping cartons are manufactured utilizing some of the same tools and equipment used where the business started. And, the company runs its own trucks to deliver orders all over the country. The apiary has been a family business for the 70 years of its existence. 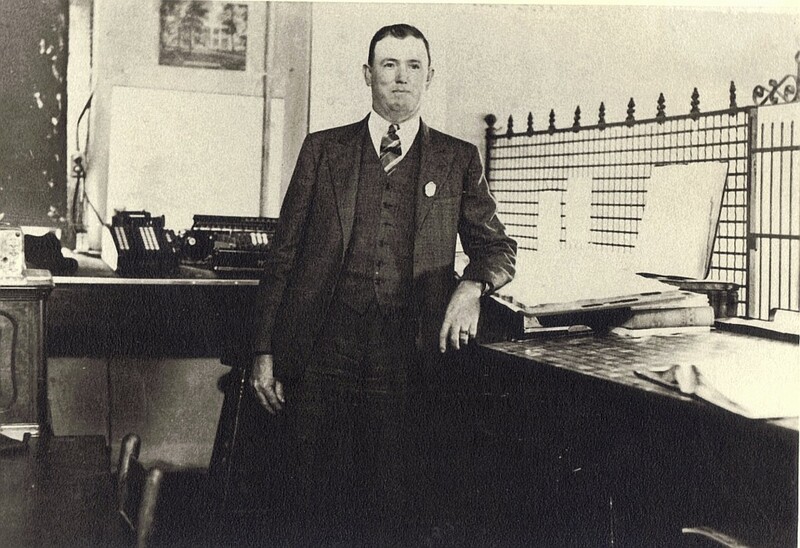 T. A. Yelverton, son-in-law of the founder, now operates it. Miss Mary Virginia Stover, daughter of the founder, retired last year after 40 years with the apiary. The business has branches in Amory, MS and Helena and Mr. Vernon, Georgia. Oscar Mullen, the first employee hired by D. D. Stover to work at the apiary, still lives in Mayhew. 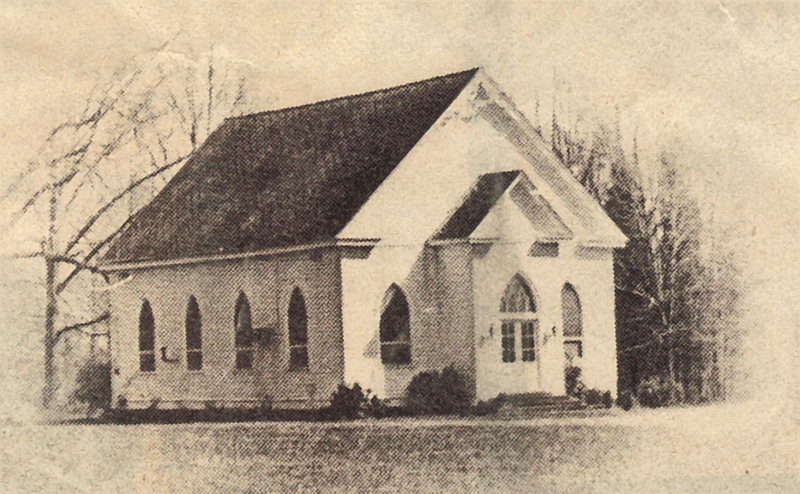 The Mayhew Union Church is shown as it was in 1978 when it was moved from Sand Creek in 1878 and served all denominations in the community. The most picturesque structure is the handsome Union church that was moved to its present location in 1878 from Sand Creek. The original pews are still in use in the sanctuary. The community celebrated the church’s centennial in 1972, before a search of the records ascertained that it actually was moved in 1878. Elisha Askew purchased the land on which the church stands. John T. Connell, W. B. Connell, G. T. Turner and Edward Herron, all of whom, except Herron, still have descendent living in or around the Mayhew area. In the early days the church housed four congregations, Methodist, Presbyterian, Baptist and Christian. Ministers from each denomination alternated holding the Sunday services, a tradition which survives today with a Baptist minister preaching two Sundays and a Methodist two Sundays. The church is the scene of weddings, funerals, revivals and Bible School, which is held every summer for the children of the community. One resident estimated that the membership of the church today is about 22, including children. Church records show that 13 boys from the church have been ordained into the ministry an enviable record for even a large congregation. The church building was renovated in 1920 and again in 1950s when additional land surrounding it was purchased. Until 1943 when it was torn down, a large two-story school building stool beside the church and it is said that the building preceded the church because it is believed that church services were held there. Mayhew Academy was the main educational institution for Mayhew children until the 1920s when it consolidated with the Artesia School. A Mayhew landmark was recently destroyed by fire when the Burgin General Store burned along with the two-story house connected to it. The store was originally built and operated by the Castles who built the store and their home over a century ago. In 148 when the Burgin store across the road burned, the Burgins bought the store. It was operated by C. B. Burgin until several months ago and was the favorite gathering place for the community. Its demise saddened the citizens and marked the end of an era for Mayhew. Along with the apiary, the church and the post office, Mayhew has a scattering of old dwellings interspersed with a few modern homes. The oldest home in the community is occupied by probably its oldest citizen, Mrs. Martha Burgin Fort who has lived there for 60 years. The Connells early settlers in the area built the house. John Tinsley Connell who was born in 1789 built another fine home, Mammoth Oaks that still stands but in a state of disrepair. No one has lived in the old place for about a year since Miss Lucie Connell moved to a nursing home in Columbus. At one time it was a charming example of Southern living. Another Mayhew home that has weathered the years is on now owned by Mr. And Mrs. Carl Solomon. The house was built in about 1866 as a wedding gift for John Davis Burgin and Martha Locke. The Solomons bought the house several years ago after it had been abandoned and are in the process of restoring it. Mayhew has distinguished itself through its native sons and daughters. Descendents f Mayhew residents or persons who themselves grew up there have gone out to all parts of the country in a variety of successful occupations. One early resident, John Henry Connell became president of A&M College in Stillwater, Ok. The roster of former Mayhew inhabitants includes several state legislators, the most recent being the present state senator from Columbus, William Burgin. The community also claims three World War II Colonels among its citizens. As one visits among its warm and friendly people, Mayhew becomes more and more fascinating as interesting little bits of information come to light. For instance, it was recently established by the Society of American Forestry that a 150-year-old willow oak tree near the old post office measures 19.3 feet in circumference only minutely smaller than the largest tree of that kind recorded. A unique situation exists in this small community where half the population is connected to the Columbus telephone exchange and the other half in the West Point Exchange. This could hamper neighborly telephone chats if they happen to be on separate exchanges. With the growth of the Golden Triangle Regional Airport nearby, the vocational technical center and the construction of the four-lane highway between Starkville and Columbus, Mayhew sits at the hub of progress. One resident commented on the four-lane highway as being a boon to Mayhew. Not because it will bring in more industry or commerce but because it will alleviate a problem brought about by large transport trucks using the Mayhew Road in order to bypass the low bridge over Highway 82 near the Vo-Tech Center. “Those big trucks have really torn up our road to circumvent the bridge,” Mrs. Swedenburg said. Mrs. Swendenberg said, “One of the new overpass bridges on the four lane highway rises above the trees and houses near the center of Mayhew. Shirley Carley said, “The W. W. Magruder home on Jackson Street in 1951, it was in a rundown condition after being vacant for some time. 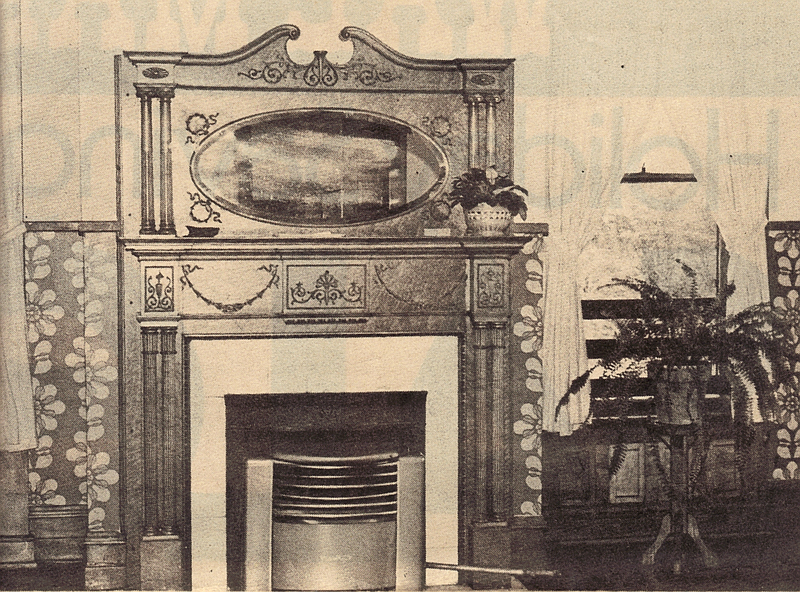 When it was built in 1900, however, the house was one of Starkville’s most handsome homes. Through several periods of repair and renovation the house, which today is the Community Youth Center add offices of the Parks and Recreation Department, remains an attractive structure and a center for community activity. The building features spacious rooms with high ceilings typical of the turn of the century. An unusual feature, for that era, was the inclusion of two large bathrooms. There were five bedrooms upstairs while the main floor held double parlors, a dining room, kitchen and spacious entry hall. Curly pine paneling was used on the walls and the floors were of solid walnut. The woodwork in the lower rooms and the handsome spindled stairway in the entry hall added distinction to the décor. After the Magruder family moved from the house, it was vacant until the city purchased it for $20,000. It was bought specifically to provide a place for the young people of the community. Parents had exerted pressure for a suitable center for the youth that previously had been allocated a small room in the city hall for their activities. A committee of youth and adult was formed to guide the development of the center. Their first order of business was to clear the lot that had suffered heavily in a severe ice storm earlier in the year. In the front lawn were two large oak trees and two magnolia trees while the back boasted 16 tall cedars, three oaks, five pecans, one elm and 38 fig trees. donated furnishings for the apartment and the rest of the building. The official dedication of the Youth Center was held in December. The following summer, recreational programs for youth were begun and continued to be offered each summer for many years. Classes in art were also available and the center was often the scene of art exhibits. In 1959, Mrs. Opal Haney became the resident hostess. The following year the kitchen and downstairs rooms were redecorated and a tennis court was constructed on the lower back lot. Activities expanded to include dances and open house after Starkville High School home football games. The boy and girl scouts began holding their weekly meetings there. The boys constructed picnic benches for the yard and the girls decorated two of the upstairs rooms. Included on the activity schedule during these years were classes in flower arranging and art along with card parties, lectures, talent shows and a weekly youth radio broadcast. After Mrs. Haney left several years ago, a permanent hostess was not employed. The left side of the building now houses the Red Cross office and offices for the P&RD department that oversees use of the facility by community groups and also supervises the upkeep. An active program for the elderly has been initiated along with classes in various crafts, cooking and exercise for adults and young people. Boy and girl scouts continue to meet there, and the center is also available for young people on Saturday nights when parents volunteer to chaperone. A regulation pool table, pin-pong table and games of all kinds from monopoly to croquet offer entertainment and fun. “We’re looking for a juke box so the young people can enjoy music here too,” commented P&RD director Forest Ponder. In the back yard are several picnic tables and a Tot Lot filled with playground equipment donated several years ago by the Starkville Jaycees. A contract has been let to resurface the old tennis court and future plans call for a fence and lights for the courts as they can be utilized for lessons. In the past several years, renovation and redecorating of the meeting rooms and offices has been continued. A few years ago a new roof was put on the house and recently the repair and painting of the exterior was completed along with installation of a metal outside fire escape. Today, it is the home of Genevieve Maxon-Stark who is restoring it.